The Refined Wood Bar 6Ft. is a unique statement piece. 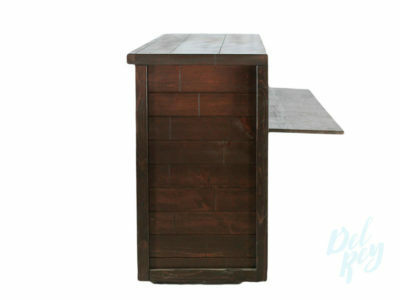 This bar is made of distressed hand stained Cedar and Pine wood. It is perfect for your rustic themed events. This is a popular item as it is easily incorporated into any color scheme. This product adds a touch of sophistication and grandeur. Your guests will be impressed with the bar and your bartender will love it! It is commonly used in weddings, galas, black-tie events. Made of distressed hand stained Cedar and pine wood.